Many other Industrial and Commercial applications. The Compacting Dumpsters are a liquid tight (up to 17") design that allows for both wet and dry waste to be compacted and stored while awaiting disposal. These Outdoor Compactors (also referred to occasionally as Compactor Dumpsters or Dumpster Compactors) offer a unique way to handle large amounts of trash with very little space outdoors. Trash Haulers are able to 'tip' these compacting dumpsters in the same way that they do their other (non-compacting) dumpsters. Oftentimes, waste hauling costs can be cut in half as a result of the reduction in service (tipping) requirements. In addition to substantially reducing tipping fees / charges, these compactors can also help towards greatly reducing scavengers, insect and rodent problems, odor problems, fire hazards, overflowing dumpsters and much more. 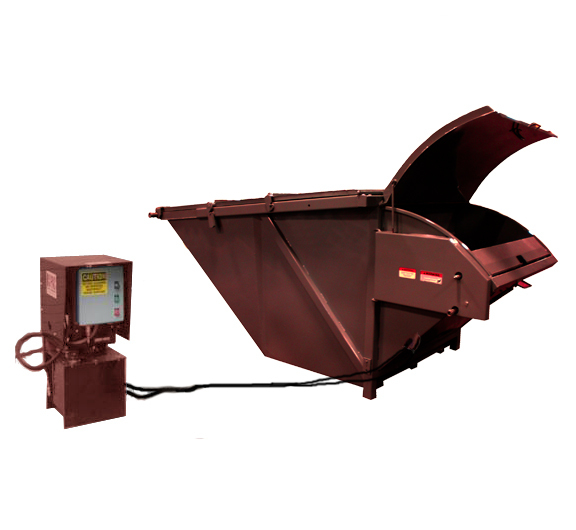 Many standard features help make this a must for numerous waste processing applications. For example, the counter-balanced loading door is easy to open and the loading height is only about 3 feet. In addition, the power unit is free-standing and can be placed nearby the trash compactor at the most convenient location. 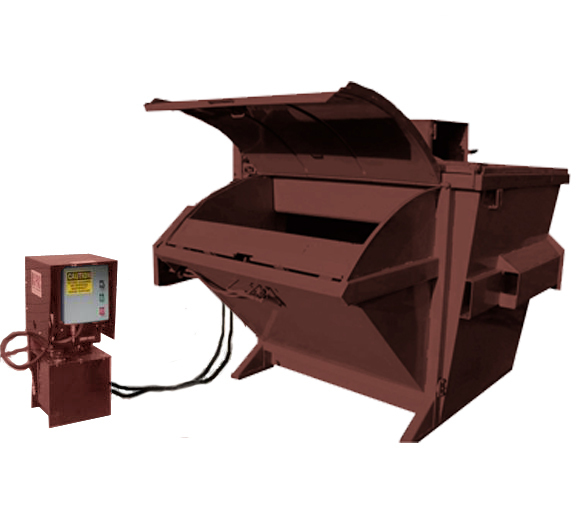 The operation of the outdoor waste compactor is simple and safe. After opening the counter-balanced loading door and discarding the trash into the large one cubic yard hopper, it is just a matter of closing the door and pushing the start button. The waste compactor cycles completely within 20 seconds and it is ready to accept more trash. These trash compactors come with many safety features such as a dual interlock system on the loading door and keylock controls that prevent unauthorized and unsafe operation. In addition, all controls are UL listed and the compactor meets or exceeds all ANSI and OSHA standards.